**UPDATE 18/9/18** Ollie Baines won the RSPSoc President’s Prize for the best oral presentation of his MSc Remote Sensing dissertation project, estimating London’s urban forest cover, at the NCEO annual conference, Birmingham, 5-7 September. See below for more details. See Phil's beautiful Sketchfab model of the Curtain Fig at Yungaburra, scanned by he and Allie during the recent work in Aus. That is an *amazing* tree. It's been a busy summer for the various teams we have out there measuring trees. It started in July with Andy and Allie off to Malaysia, with nary a hiccup. Oh, other than our kit going missing for 2.5 weeks in transit. It got there in the end, but that wasn't in the plan - Andy and Allie just got started than had to come back, to be spelled by Phil. 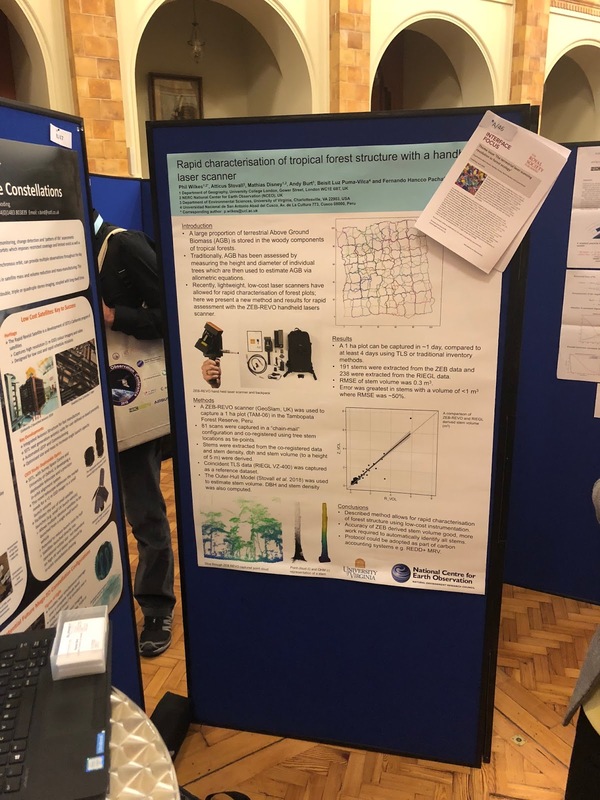 This is part of our NERC project measuring large tree architecture to understand the relationships between form and function, with Yadvinder Malhi, Lisa Bentley and Brian Enquist. Allie and Andy, trying out the new tree QR codes for automatic tree recognition from the lidar data. Allie with our collaborators in Malaysia. So in this case, the aim is the structure of a smallish number of specific trees, for which there are traits measurements, rather than 1 ha plots. This involves making sure we can ID the specific trees, so Phil developed some fancy new QR codes. 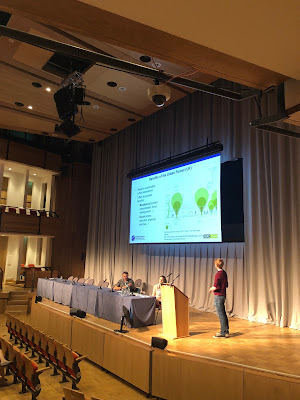 We've always thought that being able to ID the trees automatically from the lidar *must* be the way to go, but Phil's worked out a good way to do it - QR codes that are big enough to be recognised automatically in image data form, even as point data. Once again, *who* chose this plot? Some "challenging" terrain shall we say. Allie and the team in the field. Allie and Phil then moved on to Australia, northern Queensland, to some of the plots where Kim Calders and the Ghent team are also working. We're working with them to double up on TLS measurements, along with Harm Bartholomeus and the Wageningen Ricopter team. Although again, some shipping issues have led to a few delays. What is it with UAVs, batteries and paperwork?? The methods we're using here involve destructive branch sampling. So first of all some bowskills are required - Phil "Katniss" in action here, so end up a line and snag a branch for climbing and cutting. Then the branches are placed in a lab, or the lounge of your AirBnB, to get no wind & stable lighting conditions, to capture high resolution lidar scans as well as 360 photography for SfM point cloud reconstruction. Allie prototyped this method back in the UK and it seems to work really well thus far. Meanwhile, all these measurements have led to us thinking about 'extreme' trees - what the drivers of morphology are. So, while soil type, terrain, competition, herbivory, snow, rain etc. all have their place - wind can do funny things. Here's a 'tree' from a Pembrokeshire clifftop that kind of illustrates just how plastic this morphology is. 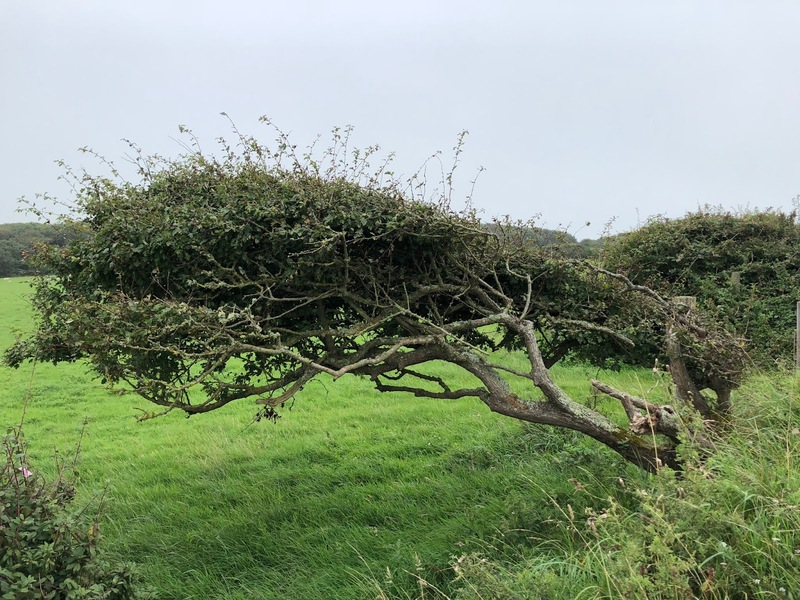 A few 100 m away, in a more sheltered part, these hawthorn trees grow quite straight, up to 10 m or so in height. Any way the wind blows, doesn't really matter. Andy and Matheus are preparing to go off to Caxuianã to do some destructive tree harvests. We have axes, tarps, straps, logging tools. And this. Can hardly even lift the weighing scale it's so heavy! Meanwhile, we have had various MSc students working with us over the summer on a variety of lidar-related topics (not all TLS for once!). Wanxin Yang did some very nice work using our PiCUS sonic tomography instrument on some trees in and around UCL to try and understand if and how it can be used to make more quantitative measurements of wood density. This approach has been used for quite a while by forestry professionals to indicate the status of trees (damage, hollows etc). But if we can use relatively quick, non-invasive measurement like this quantitatively, this would be very useful for biomass and structure studies more generally. Wanxin's work has shown some very interesting results - more on that soon. Measuring wood density of Plane trees (L, R) and lime (Centre) in and around UCL. Picture: Wanxin Yang, UCL 2018. Quantifying how hard the nail is being hit with the sonic hammer (yes, really). Picture: Wanxin Yang, UCL 2018. Meanwhile, Oliver Baines was doing some excellent work mapping London's trees in terms of number, height and % cover, by combining the EA lidar data with Landsat, and some up-scaling. More on that later too. Olivers' headline figure is just over 9 M trees, which is slightly higher than current best estimates but very much in line with our recent work in Camden on this. 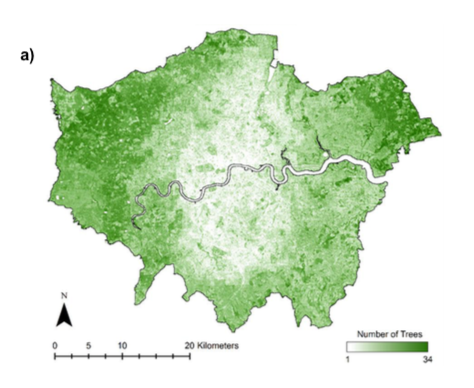 Trees per unit area, at 30m resolution across the Greater London Area. Picture: Oliver Baines, UCL, 2018. Oliver's work is something we want to take further, with other lidar and EO data and comparing to ground-based TLS estimates particularly for height and crown-size validation. The numbers on tree height and canopy cover have some quite important implications for valuing and managing (& hopefully expanding!) urban green space. More on that soon as well. 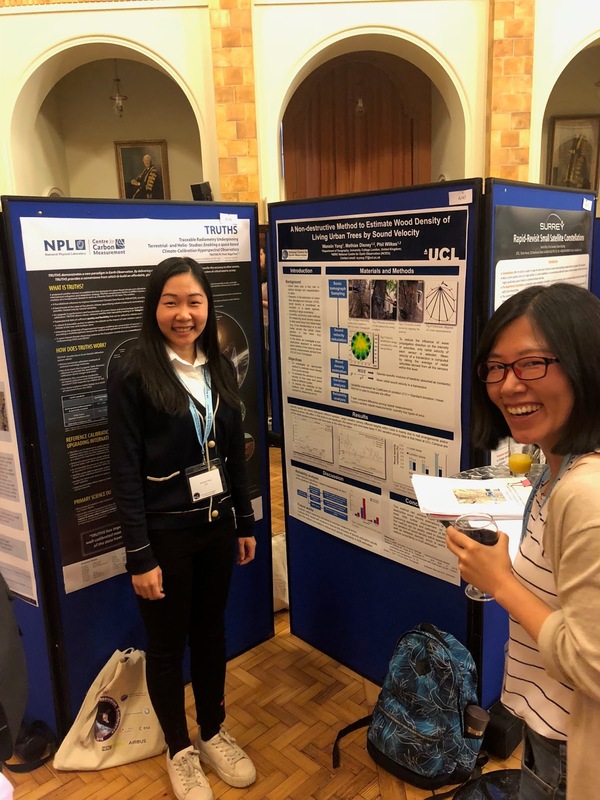 Both Wanxin and Oliver presented their work to the NCEO National Conference in Birmingham early in September, and generated lots of interest. Wanxin Yang presenting her work on the PiCUS and wood density. Oliver Baines talking about London's tree cover. Phil's poster on the ZEB-REVO work in Peru.